Residenza La Torretta can accommodate up to 4 people and is located in one of the most renowned neighborhoods in Rome, the Aurelio district! 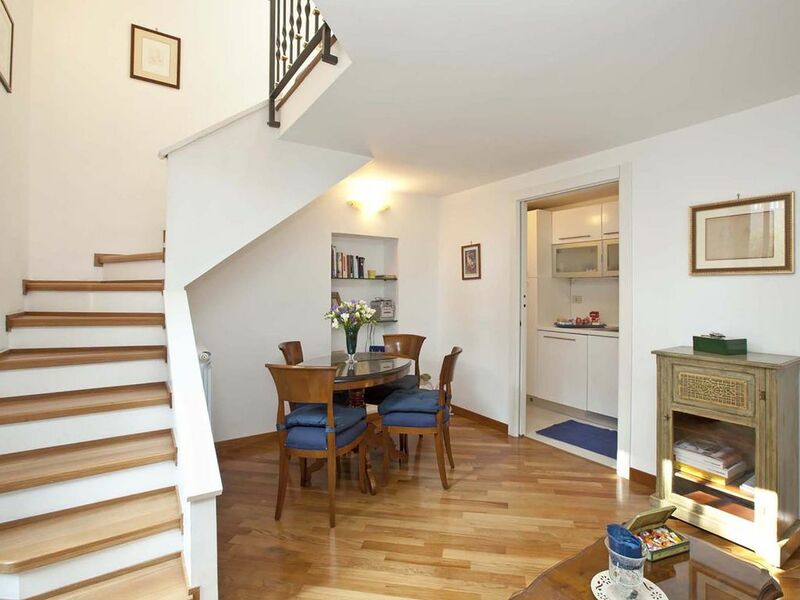 The area is full of shops, bars and restaurants and the apartment is only 350m from Villa Carpegna and 700m from Cornelia metro station, so you can go out on foot, by bus or by metro! Residenza La Torretta is located on the first floor and is exposed to the south, so is very bright and has been recently refurbished to offer guests a refined ambience that makes them feel welcome! - kitchen, fully equipped for preparing meals, with boiler, coffee machine and dishwasher, oven.. The apartment has a mezzanine structure with high ceilings (tot cm) that hosts bedroom and bathroom. Residence La Torretta is equipped with all comforts: air conditioning, independent heating, parquet floors, Wi-fi, washing machine, dishwasher. The mezzanine structure does not make the apartment suitable for people with reduced mobility. Within the service are sheets, towels, utensils, dishes and a small selection of breakfast items (tea, coffee, jam, biscuits, nutella ...). Residenza La Torretta is a magical place, close not only to the Vatican Museums and St. Peter's Basilica, but also close to Gianicolo, one of the best places to watch the city from the top, have a cocktail under the stars and stroll in some of the most beautiful streets in Rome! Via del Casale di San Pio V is a quiet street, no chaotic or noisy, but you have to walk just for few meters to see the life of the neighborhood. Simply leaving the house you will find all the necessary services: bars, restaurants, shops, supermarket and pharmacy. THE DISTRICT: The Aurelio district takes its name from the same street, at the beginning an Etruscan area, then used as an area of cultivation, knows its development after 241 BC. It is famous for the many clay caves and furnaces that are remembered in local toponymy. As the years go by, the district expanded and, now a days, is considered one of the most beautiful and authentic district of Rome. In this quiet neighborhood, day out you can shop or enjoy typical Roman cuisine, in the evening you can relax by strolling through its quiet streets or by having an aperitif in one of the many bars and clubs. My name is Lucia and I live in Rome! It's my pleasure to meet people from the other countries. The passion for cultures other than mine and the pleasure of meeting new people have always accompanied me and renting my properties as holiday homes has been the ideal solution to do what I like! The house is designed giving maximum attention to details and every choice has been made with heart! The reason why i have decided to rent this house as a vacation home is due to the pleasure of meeting people from all over the world, welcoming them and make them feel at home. Making a good relationship with my guests is of immense satisfaction. The environment is warm and welcoming. The location of the apartment is central and the neighborhood is quiet and safe. I like to take care of my guests and i try to assist them from the beginning to the end! The numerous reviews make me think that maybe I've succeeded in my intent! The bathroom has a large window and is complete with sink with large wall mirror, shower cabin, bidet and WC. The bath linen is included in the rental price of the apartment. The apartment is equipped with an efficient air conditioning system as well as central heating. We spent four days at this apartment at the end of September. It is very well appointed, spotlessly clean and in a quiet location. The transport links into Rome are excellent with bus and Metro stops within a fairly short walking distance. Lucia is the perfect hostess who made us very welcome on our arrival, taking time to explain all we needed to know about the apartment. We would recommend this as a great place to stay for a short trip to the city. Myself and my 2 sisters stayed at this apartment for 4 nights. We arrived late on the first night after a delayed flight but Lucia’s son was still there to welcome us to the apartment. The apartment itself is compact and clean and was perfect for what we were after. It is located about 15 minutes walk from the Metro A line which brings you directly to all of the top tourist attractions. Lucia was contactable throughout our stay and nothing was too much trouble. We had a great stay and I would highly recommend this apartment. Rome was beautiful as ever. Comfortable and quiet. Lucia is very accommodating. Modest walk to metro stop. I have so enjoyed this property. The apartment is very comfortable. It is well appointed. There is a short walk to buses that go directly to the Vatican and Piazza Venezia. It is very close to Cornelia and Baldo Deli Ubaldi Metro stops. The Pamphillij Park is very close for any walkers and joggers. We walked several times and there is a lovely cafe within the park. It also is beautiful. The terrace is large and comfortable and sunny. The kitchen is well equipped. The bed large and comfortable. Closet space is good. Bathroom typical and clean. Excellent cleaning service available. Grocery stores etc nearby. Fine restaurants nearby. This is a very positive experience. Lucia is warm and very helpful. RAPPELONS DE NOTRE SEJOUR A ROME, L'ACCUEIL EST IMPECABLE, L'APPARTEMENT EST DOTE DE TOUT LES CONFORTS PREVUS POUR SE SENTIRE VRAIMENT CHEZ SOI. SITUE DANS UN QUARTIER PARFAITEMENT JOIGNABLE, GRACE AUX BUS A PROXIMITE. Domy, Je vous remercie de vos paroles! Vous et votre famille ont été des hôtes parfaits, je vous remercie pour les compliments à "La Terrazza". J'espère que vous reviendrez à Rome bientôt! The apartment 'The Terrace' enjoys a wonderful location logistics that allows you to be within walking distance of public transport but in a private area, reserved and quiet it offers, if you wish, can return at any time to rest in quiet after a busy day of sightseeing. Almost opposite the apartment is one of the entrances of the magnificent Villa Doria Pamphili, one of the most beautiful parks in the city of Rome. This area, like many of the Roman parks, originates from the country estate of a noble Roman family. Villa Doria Pamphili in 1971 became the largest public park in the city and today is very popular with joggers. The oldest, the n. 183 Via Aurelia Antica, already existed when Panfilo Pamphili bought in 1630. Other Activities: jogging, relaxing walks in the park Dora Villa Pamphili. Golf: The Parco de 'Medici Golf Club: home to major international races the championship course was designed by Italian architect David Mezzacane and tracked by American Peter Fazio. It is one of the few Italian paths reminiscent of celebrated Scottish links: lying between Rome and the sea, the game is influenced by the sea breeze. It is a very technical, full of water hazards consisting of 6 ponds destination for migratory birds. Down the fairway of the 18th hole, there are the remains of a Roman building of the first century a. C.
The red course (nine holes) was designed by Fabiano Rebecchini. Some holes are particularly "sensitive" long wide greens and tees facilitate game to less experienced players.